The united front of 17 farmer and labour unions today warned the state government to concede to its demands or else they would resume their agitation that was put off earlier. An SGPC candidate from the Shahkot constituency, which is a reserved seat, was allegedly beaten up by unidentified persons at Ronta village in Shahkot during campaigning. 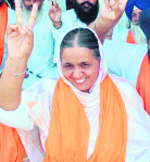 Former SGPC chief Bibi Jagir Kaur appears to be at ease amid the hustle and bustle of electoral politics. And this impression also comes across seeing the way she meets her electorate like long-lost family members. Carrying forward the legacy of her foster father the late Panth Rattan Gurcharan Singh Tohra, his daughter Kuldeep Kaur Tohra (58) is contesting the SGPC elections for the first time. He seat: Sanaur (General). She is pitted against Jasbir Kaur of SAD (Amritsar). With over 221 villages to be covered under her constituency and almost 10 days left for the voting, Kuldeep Kaur’s daily schedule starts as early as 7 am. She tries to reach villages early so as to meet the villagers at their homes. If assurances given by Union Law Minister Salman Khursheed to a delegation of the Delhi Sikh Gurdwara Management Committee is any indication, the Anand Marriage Act may become a reality soon. Describing the Badals as second-generation mahants misusing the SGPC, Punjab Congress chief Capt Amarinder Singh today asked Deputy Chief Minister Sukhbir Badal not to divert the people’s attention from the real issues by trying to exploit their religious sentiments. The election campaign of Agriculture Minister Sucha Singh Langah to retain the Dhariwal SGPC seat was put on the backburner with Deputy Chief Minister Sukhbir Singh Badal preferring to train his guns on former Chief Minister Capt Amarinder Singh at most of the meetings addressed by him at various places in Gurdaspur district. Claiming that during the past 10 months the People’s Party of Punjab (PPP) had emerged as the third political force in Punjab, PPP supremo Manpreet Singh Badal said the police was filing filing cases against his party workers at the instance of the government. This, he sais, showed that the SAD leadership was in a state of panic over the people’s response to the PPP. Heavy rain over the past four days have caused extensive damage to cotton crop in the Malwa region, thus hitting the cotton growing farmers hard. Crop in at least 28 villages in CM Parkash S Badal's constituency Lambi (Muktsar) has been completely destroyed with fields getting submerged due to rise in subsoil water and heavy rain. The entire area is waterlogged and over the years drains have been dug up without much application of mind which has further complicated the problem. 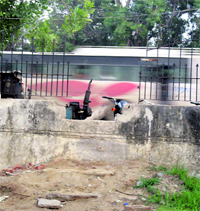 Controversy pertaining to the opening of an illegal gate in Rajindra Hospital, Patiala, refuses to die down with chemists opening the gate again. The junior engineers working with the two power utilities of the state- Punjab State Power Corporation Limited (PSPCL) and Punjab State Transmission Corporation Limited (PSTCL)- staged demonstrations in all parts of the state today. The cyber crime wing of the Punjab State Crime Branch, Mohali, has arrested a man for allegedly creating a fake profile of a woman from Sultanpur Lodhi, Kapurthala, on Facebook. The announcement came after scores of activists of these organisations reached Goindwal Sahib in Tarn Taran to immerse the ashes of Dheer Singh Gagomahal, a farmer who died of heart attack during their protest in Amritsar on August 23, in the form of a procession. 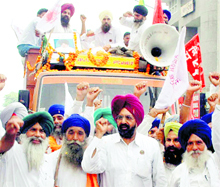 The farmer leaders told that the procession covered a distance of around 100 km and passed through Ajnala, Amritsar and Tarn Taran before culminating at Goindwal Sahib. Addressing the activists, farmer leaders Rattan Singh Randhawa, Satnam Singh Pannu and Davinder Singh Chatiwind alleged that the state government had turned a blind eye to the Supreme Court verdict, as per which cultivable land could not be acquired, and went ahead to acquire 166 acres of land at Gobindpura in Mansa without the consent of the farmers. They warned that the forcible acquisition of land would never be tolerated. They demanded that the government should restore the 166 acres of land to the farmers in Gobindpura. They also urged the government to pass a resolution in the assembly rejecting the land acquisition Bill which has been tabled in Parliament. They cautioned that if the state government didn't concede to their demands they would resume their agitation. Shiromani Akali Dal candidate Baldev Singh Kalyan told The Tribune that when he was addressing a rally at Ronta village late last evening, a local resident began to misbehave with him. “When I objected, he and another man started thrashing me and my turban came off,” alleged Kalyan. He said the attack was unprovoked and that he had enmity with none. “The man blamed me for helping a third party in a property dispute some time back. But I can’t recall the incident he was talking about,” a visibly shaken Kalyan said. Asked if he would initiate any legal action against the attacker, the SGPC candidate said he would first discuss the matter with the party high command. Sources revealed that the attacker and his men were also supporters of the Shiromani Akali Dal. Kalyan, an SGPC member from the Nakodar constituency, is now contesting from Shahkot. But, she had to do some introspection after her defeat in the assembly polls, which her critics attribute to “overconfidence”. This time, she is taking no chances — an elaborate network is in place. A caravan of vehicles rolls out of her residence at Sant Baba Prem Singh Muralewale Gurdwara complex at about 8.30 am. Dressed in her trademark while suit and matching sneakers, the three-time SGPC chief is all ears as she meets people. People swarm around her and she does not disappoint anybody, calling the familiar ones by their names and hugging those more-known. There’s a little pat for the kids and a blessing sought from the elderly. At various gathering, she promises “steps against apostasy, drug abuse, environmental degradation and female foeticide”. Bringing back to the Sikh fold those who have “strayed” is also her agenda. Elated at the crowd she is drawing, she cannot conceal her ambition: “I am doing groundwork for the assembly polls.” She takes a swipe at her opponents: “Mohan Singh Bal (Panthic Morcha) is an outsider and has been propped by the Congress while Balkar Singh Lubana (SAD-A) is yet to appear on the horizon.” Bal, for his part, claims he has been receiving “overwhelming response” from the electorate because of the “misrule” of the Badals and “the fact that the Bibi herself has “flouted” all Sikh norms. Carrying forward the legacy of her foster father the late Panth Rattan Gurcharan Singh Tohra, his daughter Kuldeep Kaur Tohra (58) is contesting the SGPC elections for the first time. He seat: Sanaur (General). She is pitted against Jasbir Kaur of SAD (Amritsar). With over 221 villages to be covered under her constituency and almost 10 days left for the voting, Kuldeep Kaur’s daily schedule starts as early as 7 am. She tries to reach villages early so as to meet the villagers at their homes. “Afternoons and evenings are for public meetings… the scorching heat has made our job a little tough,” says Kuldeep Kaur, the wife of former minister Harmail Singh Tohra. She is also a contender for SAD assembly ticket. 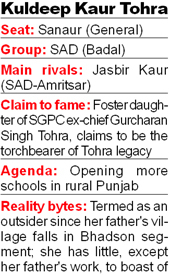 Notably, the Tohra family has been associated with the SGPC for the past over five decades. 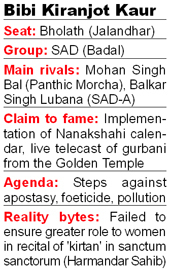 SGPC ex-president Gurcharan Singh Tohra was its member for over five decades at a stretch. Kuldeep Kaur doesn’t forget to mention about Tohra while campaigning. The Tohra family was keen on fielding her from Bhadson, the ancestral village of the Tohras, but the SAD leadership agreed on Sanaur seat. “I have no problems with it (contesting from Sanaur) as my father has done a lot for the Sikh community,” she says. Meanwhile, Jasbir Kaur was earlier a covering candidate for Gurmeet Kaur, who was disqualified as she was found uneducated. The Tohra faction claims to have bagged as many as 15 seats in these elections. Talking to The Tribune over the phone, DSGMC chief Paramjit Singh Sarna said Khursheed assured him and the delegation that there would be neither any further complication nor any delay in getting the Anand Marriage Bill passed by Parliament. During their 40-minute meeting with Salman Khursheed this morning, members of the delegation apprised him of the anguish amongst the Sikhs over his reported statement rejecting the demand for the Anand Marriage Act. “There has been a widespread resentment amongst the Sikhs as the previous Union Law Minister V Moily had told newsmen that draft of the Anand Marriage Bill has been approved and was pending the Cabinet clearance before its introduction in Parliament. We also told him that earlier UPA chairperson Sonia Gandhi, too, had assured the DSGMC delegation of getting the Anand Marriage Act approved at the earliest,” Sarna said. Sarna said Khursheed admitted that when the issue about the Anand Marriage Act was raised in Parliament, he made the statement without going through the file. The Union Law Minister also regretted making the statement that hurt the sentiments of the Sikh community, said Paramjit Singh Sarna. He reportedly told the DSGMC delegation that since he himself belonged to a minority, he could understand the hurt it may have caused to the Sikh community. “I hold the Sikh community in high esteem for the numerous sacrifices it had made in the country’s freedom struggle, besides helping the country become self sufficient in food,” Khursheed told the delegation. The DSGMC delegation also submitted a memorandum to Khursheed. Only yesterday, Punjab MP Partap Singh Bajwa had also met Khursheed and apprised him of the background and the history of the Anand Marriage Act. Bajwa also urged the Law Minister to get the draft vetted soon before getting it cleared from the Cabinet so that it could be placed in Parliament without any further delay. “How have I maligned the SGPC by simply asking for an explanation on the massive deficit in the Darbar Sahib accounts,” he asked Sukhbir. “The general perception is that you have been blatantly misusing SGPC funds that has led to this deficit”. “You, your father and some of your henchmen have turned out to be second-generation mahants who are manipulating and misusing the institution for personal gains”, he remarked. On Sukhbir’s allegations of dividing the Sikhs, Capt Amarinder observed: “You have already divided them into Sehajdharis, patits and others”. The election campaign of Agriculture Minister Sucha Singh Langah to retain the Dhariwal SGPC seat was put on the backburner with Deputy Chief Minister Sukhbir Singh Badal preferring to train his guns on former Chief Minister Capt Amarinder Singh at most of the meetings addressed by him at various places in Gurdaspur district. Addressing an impressive gathering here, Sukhbir claimed that ”incontrovertible evidence had surfaced on the dubious role” played by Capt Amarinder Singh in an attempt to derail the SGPC elections. He said the PPCC chief should apologise to the people for telling lies in an attempt to vitiate the atmosphere through divisive politics. Sukhbir said this Congress strategy had led to disastrous consequences in the past. Claiming that during the past 10 months the People’s Party of Punjab (PPP) had emerged as the third political force in Punjab, PPP supremo Manpreet Singh Badal said the police was filing filing cases against his party workers at the instance of the government. This, he said, showed that the SAD leadership was in a state of panic over the people’s response to the PPP. Manpreet said with assembly elections just six months away, Chief Minister Parkash Singh Badal and Deputy Chief Minister Sukhbir Singh Badal were not sure which seats they would contest. They were desperately looking for seats. He said his father Gurdas Singh Badal would contest from Lambi and he would fight from Gidderbaha. Noted Punjabi comedian Bhagwant Mann would also contest on the PPP ticket. He said a couple of NRIs would also contest as PPP candidates. Claiming the PPP was sure to form the next government, Manpreet said only five or six persons had deserted his party so far. He warned Sukhbir of causing a major dent in the SAD support base in the next 100 days.. Accompanied by his father and Bhagwant Mann, Manpreet addressed an impressive meeting of party workers here with all chairs occupied and people squatting on the floor. Manpreet said the party’s organisational structure would be announced in a fortnight. On his “100 days programme” in case he came to power, he said he would work towards enactment of the right to education Act, child labour Act and NRI marriage regulation Act. He would ensure a better deal for teachers. He denied his party had a secret pact with the Congress. “We may form an alliance with like-minded parties... talks are on with the CPI and the CPM,” he said. As farmers had fetched high price of cotton last year, they had increased the area under cotton by 60,000 hectares this year. "We have got reports from the officials concerned that rain has caused a heavy damage to cotton crop in core belt," said a senior official of the Agriculture Department. He said accumulation of rainwater in most of the fields had proved harmful for the crop. Director of Agriculture Balwinder Singh Sidhu said: "We are really worried as the rain continues to lash the crop in the cotton belt for the past some days." The crop is at the picking stage at most of the places and owing to this reason, the situation is more alarming for the farm community, he added. "We had fixed a target to produce over 21 lakh bales this year as the area under the crop has gone up to 5.6 lakh hectares from 5 lakh hectares last year," he added. Other major worry for the department is the likely low price of cotton this year compared to the last year. Union Textile Ministry has convened a meeting of senior officials of cotton growing states on September 16 in New Delhi. Various cotton-related issues, including export, would be discussed. Jagpal Singh Abalkhurana, a Congress leader, said the number of villages would be much more that 28. 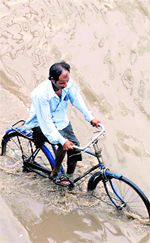 He said the entire cotton crop in these villages had been completely washed away. The government spent huge amount to install electric motors in the areas so that the water can be pumped and put into drains. But since the drains have been dug without keeping the flow of water in mind, it has not served the purpose, he said. The said gate straightway leads to some of the drug stores operating just next to the hospital premises and there has been a lot of hue and cry about this gate earlier. This gate has been opened twice earlier, but was closed after interference of the Medical Education and Research Minister and the authorities concerned. After the authorities closed the gate on August 19, the chemists opened the gate again within 20 days. The matter had come to light when the Karamchari Dal (Bhagdana) Rajindra Hospital Branch president Gurmukh Singh gave a memorandum to the Medical Superintendent of the hospital in this regard and had alleged that the gate was totally illegal and had been opened to facilitate the chemists. “After I got to know about the opening of this gate again, I called the cops and have already deputed two security guards to ensure that no one crosses it. We have temporarily closed the gate today and will get it welded tomorrow,” said Medical Superintendent Dr Manjit Kaur Mohi. Expressing strong resentment over the dilly-dallying attitude of the Punjab Government pertaining to various long-pending demands of the junior engineers, the protestors protested outside the PSPCL offices and took out scooter rallies to express their resentment. Addressing the gathering of the junior engineers at Patiala, president and general secretary of the president of the Council of Junior Engineers, PSEB, Sawarn Lal and Davinder Singh respectively, said the state government was delaying the issue since a long time. Flaying the state government, the council leaders accused the state government of overlooking the interests of the engineers, notwithstanding the fact that they play a major role in ensuring uninterrupted power supply in the state. The arrested has been identified as Kanwaljit Singh (25), a Jagroan-based software professional. A case under Section 66 A and 66 D of the IT Act and Section 419 and 509 of the IPC has been registered against him. Kunwar Vijay Pratap Singh, SSP State Crime Branch, said the motive behind the crime was to defame the complainant because of some personal enmity. The case was investigated by a team of officials headed by DSP Vibhor Kumar. The fake profile displayed the woman’s phone number and other details. The profile said she was an organiser of a musical dance group and could be contacted on her mobile number and e-mail. The woman started receiving calls on the basis of her profile and she was forced to approach the crime branch. The SSP advised to share minimum information on Facebook and verify the identity of the person before adding him or her in the friend list. He said one could complaint at policehelp100@gmail.com or ssp.cyber-pb@nic.in.